Dog treat Bakery selling nutritious homemade treats such as Black Pudding & Pancetta, Smoked Salmon & Cream Cheese, Choc Chip Cookies, Donuts, Muffins, Cupcakes and much, much more. Dog friendly Deli in Portobello High Street. The pub has an Australian theme which adds to the chilled out atmosphere. There is sand on the floor, lots of big comfy sofas and hilarious pictures in the toilets. We tried the homemade lemonade and nachos which were amazing. The tea and cakes on offer also look pretty good (as well as the beer). Very friendly place. The Dugs have their own area which is the Sofa area at the back. 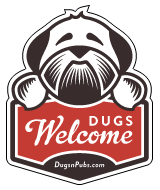 You can enter via the “Dug Door” at the side of the pub. There are a total of 20 dog friendly listings in the Portobello category. Please log in, or sign up as a member to view all listings.